At Hills Professional Removals and Storage, many years of experience and thousands of relocations have taught us that from time to time, things may happen which are out of our control. We will treat your possessions with the same care that we would our own, and because of that, we think that if your possessions are important enough to you for you to move them to your new property, then they are important enough to be insured. We are distributors for CARTS Insurance, who are underwritten by Allianz Australia. The CARTS product range has been developed specifically for customers moving house, across town or across the country. Insurance can be arranged by visiting their interactive website at www.removalsinsurance.com.au, or they can be contacted on 1300 880 253. To discuss your removal or storage requirements with one of our friendly team, call us on 02 9624 5638 or 0410 640 672, request an online quote, or send us an email. Hills Professional Removals and Storage (HPRS) is a family owned and operated business, which has been working as a removal and storage team for many years. We take pride in building strong relationships with our customers, and know that with removals and storage, the devil is in the detail. 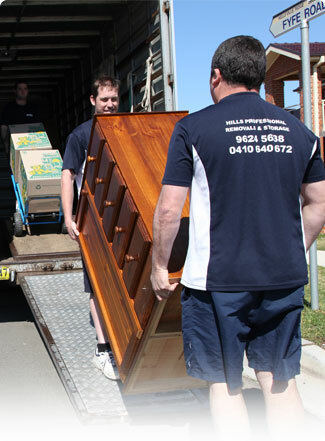 To discuss your removal or storage requirements with one of our friendly team, please call 02 9624 5638 or 0410 640 672, or email info@hillsremovalists.com.au.